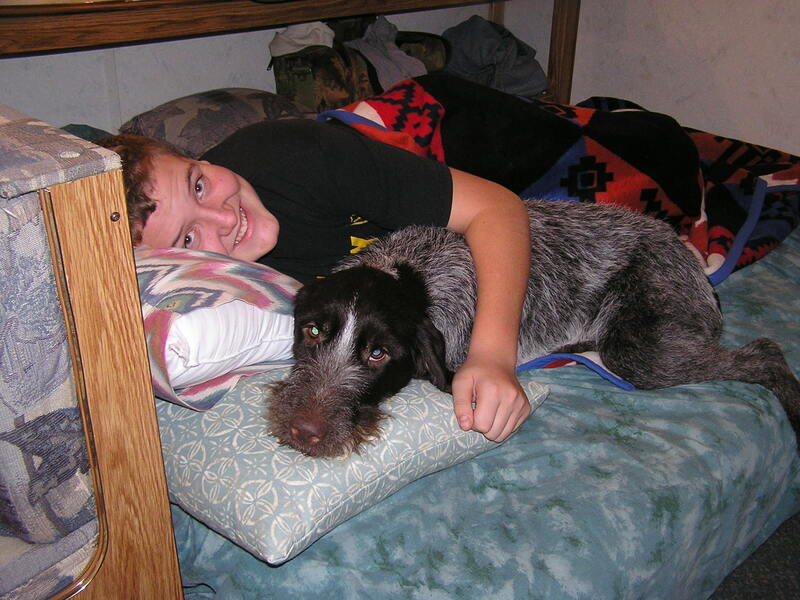 In January 2009, after much discussion, we decided that we wanted to adopt a second German Wirehair Pointer. Our first had been such an incredible experience and we loved the companionship of having a dog in the field with us. 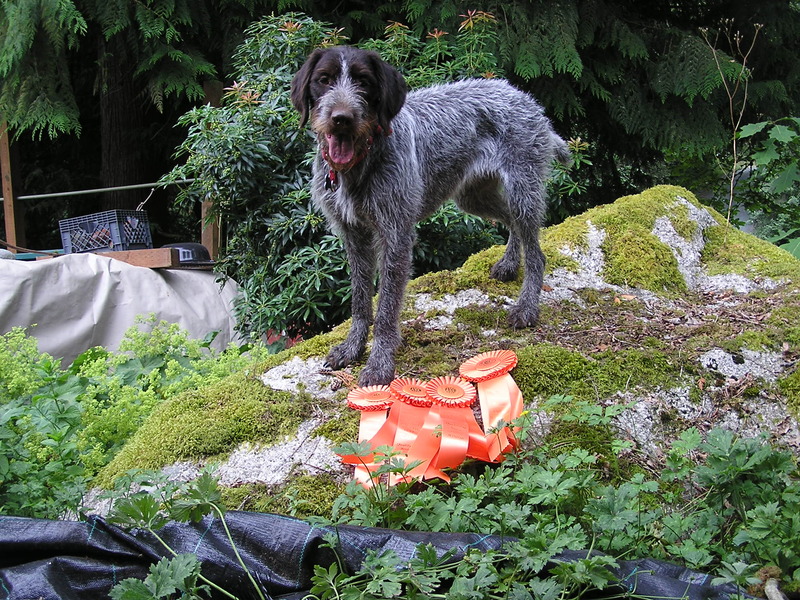 We called quite a few breeders and reviewed innumerable websites looking for litters of pups that would be available in the upcoming months in hopes that we could train and field the new puppy that Fall for hunting season. Finally, midst January winter snow storms that closed the passes and delayed us, we headed to Idaho and in search of our second pup. We met with Katherine Rager from Rimrock Kennels. She let us spend several hours on a snowy January evening in her living room playing with not one, but two litters that she’d had born in November only a day apart. Choosing amongst 16 bouncing puppy was not easy. After making some difficult choices between male or female, light or dark, this litter or that litter…..we finally selected a long legged female whom we named Rimrock’s Sioux Zee Que or Suzie as we’ve come to call her. Suzie was the alpha female between the litters and we didn’t know what that would mean when we selected her. She was as different from Annie as a puppy could be and at first we simply put it down to her younger age. She was far more busy and mischievous than Annie had been as a pup, but she was lovable and spent that first night quietly curled up with us and Annie in the motel room before we started the long and snowy drive home. Life with Suzie and Annie over the next few months was often chaotic but always filled with laughter. Two dogs couldn’t have been more different. Suzie wanted to go, go, go while Annie patiently tried to settle her down and teach the pup some manners. Suzie tried to chew everything and anything…including sometimes the cats…who quickly taught her that cats were not suitable chew toys. We ended up installing baby gates to provide everyone space and contain the busy new puppy in areas that had been adequately “puppy proofed” to keep her safe and us sane. Eventually, between our efforts to train her and her maturing, Suzie moved out the “eat the house” phase and, as spring arrived, we began to work her outdoors and started her hunt training in earnest. Again, we worked with Bob Perry and she’s got a few show points to her name although no majors yet. She is a long legged beauty with the deepest brown markings and a constant twinkle of mischief in her eyes. Our grandson Tyler actually has shown her several times and he discovered that she’d do just about anything for popcorn. Who would have thought of that as a training aide? When we put Suzie in the field and send her on hunt, all else was forgotten. Through rain, snow, swamps and mud, she demonstrated an incredible nose for birds, a stylish point, and a prey drive that was extremely intense. 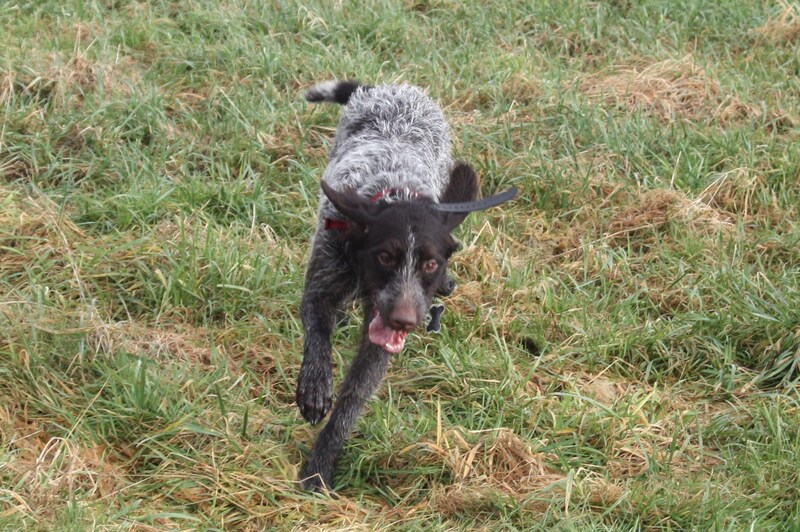 Her retrieving that first year left something to be desired as she would run by and spit the bird out at you while she continued on to find the next one. You had to be quick, or you could only hope that it was truly dead and didn’t fly off again when she tossed it your way. She is starting to mature and mellow out a bit now that she has come through her second hunting season. 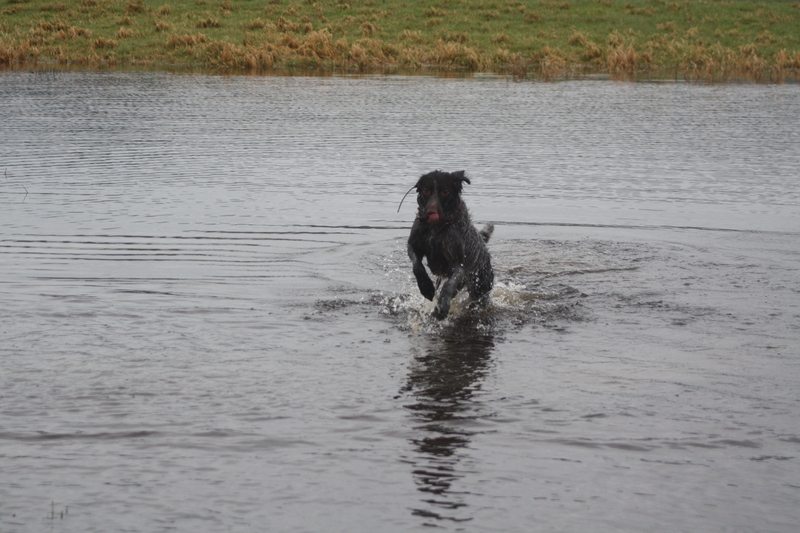 She now retrieves but still not always to hand as she is still anxious to find the next one. Her long legs and enthusiasm make her a wide ranging dog. If there is a lot of area to cover or we are going to be far out in the field all day, she is the dog we take out into the field. She is also an incredible dog for when the birds are running in the corn fields or under heavy brush or cat tails as she will dive in and won’t give up until she gets them out or flushes them to you from the deep cover. In the meantime, she remains our clown and imp in the house. She is the one mostly likely to find something to get into trouble with when we aren’t paying enough attention to her and the one most likely to curl up in your lap for a belly scratch at the end of the evening.